In the first game of the new season, it was a day of firsts for the Irish. Malik Zaire started his first game at home, Josh Adams scored on his first career carry (and then again later in the game), and Justin Yoon kicked his first career field goal for No. 11 Notre Dame. 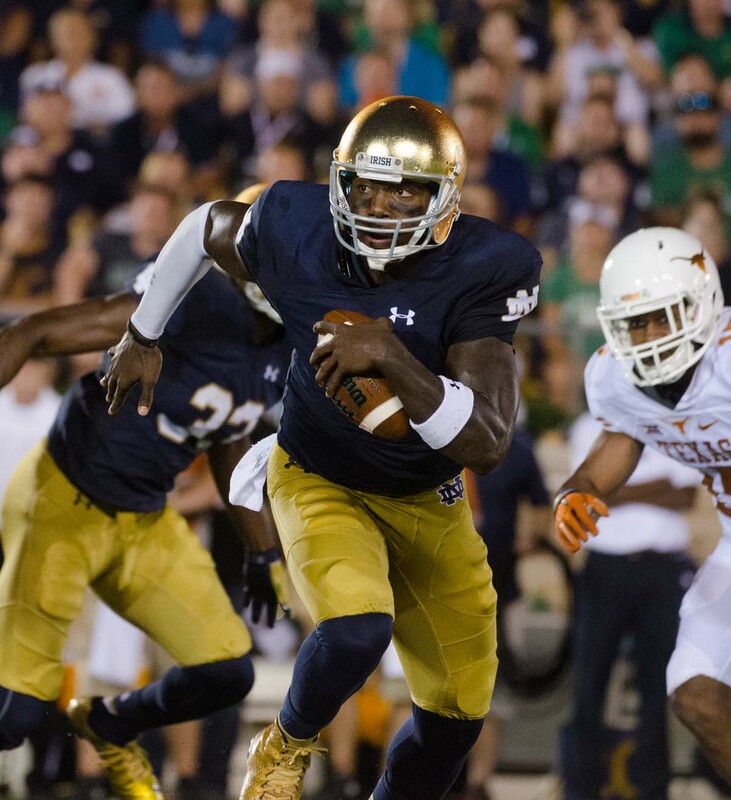 Irish junior quarterback Malik Zaire runs downfield during Notre Dame’s 38-3 win over Texas on Saturday. If anyone was worried the junior quarterback Zaire might struggle with nerves in his first start at Notre Dame Stadium, their fears were quickly put to rest. With a passer rating of 250.9, 313 yards and 19 completions on 22 attempts, the Zaire era at Notre Dame began with style. In fact, Zaire’s performance grabbed a place in the Notre Dame history. His 86.3 percent completion percentage was second all time in a single game in program history, behind only Steve Beuerlein when he faced Colorado in 1984 and converted 10 of just 11 passes. His 16-yard touchdown pass to junior receiver Will Fuller put the Irish on the board with 6:29 remaining in the first quarter. A quick Texas three-and-out was then followed up by freshman running back Josh Adams’ 14-yard touchdown run a few minutes later. The second half offered much of the same. In the third quarter, Zaire tossed a 66-yard touchdown pass to Fuller, his second of the game, which was followed up by a 25-yard Adams touchdown run, stretching the Irish lead to 31-3 before the start of the fourth quarter. Though Adams’ touchdowns were the only rushing scores for the Irish on the night, senior C.J. Prosise also offered a strong performance in his first game as a full-time running back. Prosise ended the day with 20 touches for 98 yards to lead the team. He was forced to take on a starring role after junior running back Tarean Folston sustained a right-knee injury in the first quarter that knocked him out of the game. Folston later came onto the field on crutches and will receive an MRI on Sunday morning. Fuller tied Adams for the most scores in the game and put up one of the best performances of his career, with seven receptions for 142 yards. Zaire rounded out the game’s scoring with a six-yard touchdown pass to senior receiver Chris Brown early in the fourth quarter, stretching the Irish lead to 35 points and the final score of 38-3. Afterwards, however, Zaire deflected questions about leading the team to victory. In the closing minutes of the contest, head coach Brian Kelly gave most of his starting lineup some rest, including Zaire, Prosise and Fuller. Sophomore quarterback DeShone Kizer played the final two series of the game for the Irish as they wrapped up their first win of the season. Behind the dominance of the Notre Dame offense, the Irish defense had an impressive game in its own right, limiting the Longhorns to fewer than 200 total yards of offense. Texas entered the matchup with junior Tyrone Swoopes as its starting quarterback, but with plans to have freshman Jerrod Heard take snaps as well. However, Heard completed just one pass for 10 yards and did not play past the first drive of the second quarter. Swoopes was ineffective on his own, as the Longhorns mustered 163 yards of total offense. including seven completions on 22 attempts for 93 yards from Swoopes, and only 63 yards on the ground. The defensive attack included seven tackles for loss, including one sack each from senior defensive linemen Sheldon Day and Romeo Okwara, junior linebacker Jaylon Smith and freshman defensive lineman Jerry Tillery. The one defensive lapse of the night for Notre Dame resulted in an 48-yard pass from Swoopes to freshman receiver John Burt midway through the third quarter. The play accounted for nearly a third of Texas’ total offense throughout the game. The Irish defense held on to stop the Texas offense once more, but the pass did lead to a 41-yard field goal from senior kicker Nick Rose, the Longhorns’ only points of the game. After the game, second-year Texas head coach Charlie Strong, who served as a defensive line coach at Notre Dame under both Lou Holtz and Bob Davie from 1995 to 1998, gave credit to the Irish while also calling out his own squad. The size of the blowout, combined with Folston’s injury gave the Irish the opportunity to test their depth early in the season. Notre Dame officially had nine different players rush the ball throughout the game, the bulk of those being split between Prosise and Adams, as well as freshman running back Dexter Williams, who came on near the end of the game. Kelly also said that while he was pleased overall with his team’s performance, there were still problems that need to be addressed. Specifically, he cited the four false start penalties accumulated by the offensive line, something which Zaire later took credit for. The Irish will take to the road next to face Virginia next Saturday in Charlottesville, Virginia, before returning to Notre Dame for two games.